Meet Denise. She's knitting socks. Tune in to this page to see her regular updates. So, my sock kit arrived! 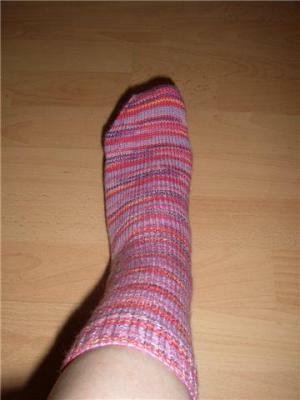 I set myself the challenge to learn to knit socks a while ago and here it is, all ready to be knitted up. I have knitted from the age of about 10, and got back into it a few years ago and haven't stopped! I am a little scared just now, learning something new! 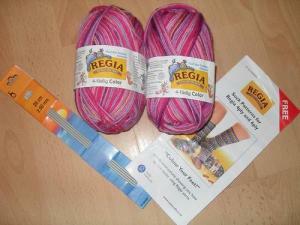 I ended up getting some self striping Regia wool with a free pattern. 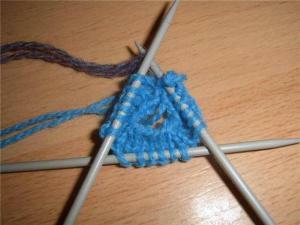 I am casting on 60 stitches and using 2.5mm needles. 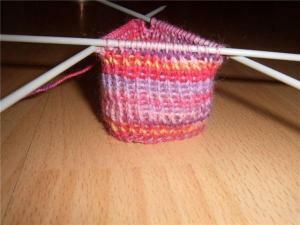 I decided I wanted to do a bit of pracise on the 4 needles. This is my first attempt. I am pretty pleased with it. I took it show my mum who knitted socks in the past, but the last time was over 30 years ago! She straight away told me I had it inside out. The smooth side has to be on the outside. And I was so pleased with myself! So, I did a few more practise pieces. I find the start really hard to do, many times I think I must have twisted the stitches or something, as I just knew it wasn't right. I got my mum to sit with me for a bit, to see if she could pass on any tips. 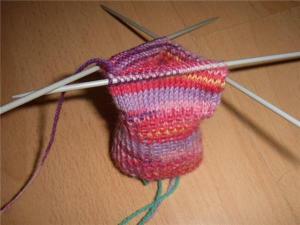 I thought maybe I was holding the needles the wrong way - I can be a bit 'cack handed'. My knitting technique isn't normal! It appears that the non working needles just get in the way, and the best method is to just concentrate on the working needles. Nearly finished the ribbing! It looks so small, I am very worried about if my foot is going to fit in it! I have shown it to someone, who says it should be OK. Aneeta says so too! 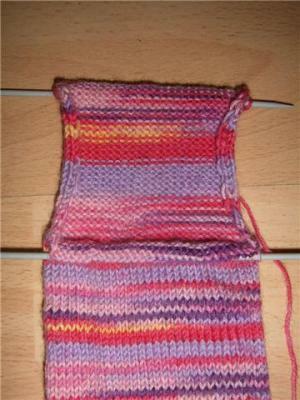 I am pleased with how it is working out so far, and am getting into the pattern of using the four needles. I am especially pleased that I don't have any ladder joins. I am generally quite a loose knitter, but when I start a new needle, I just have to make sure the first stitch is done tightly. SOS!! I am very worried that I won't get my foot in it, it seems very narrow. Is this normal? Now working on a straight bit. Still managing to not cause any ladders on the joins of the needles. For some reason, the join from the last stitch of the row to the first stitch is usually the one that had a bit of a ladder on my practise pieces. I seem to have stopped that happening. I only get to knit for a short time in the morning and then in the evenings, and I have about 10cm more to go before the heel shaping. 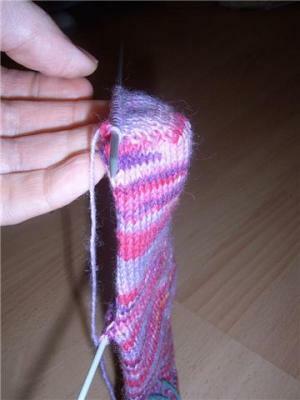 So, today I have worked the heel flap. Got a bit confused with the instructions. I had to knit 15 stitches, and then turn. Then purl 29 stitches. As there are 20 stitches on each needle, this meant having to take stitches from a second needle. When I counted the stitches, I counted ALL of them, not just the ones from the turn. I had done it right, but undid it as I couldn't work out why I had 35 stitches instead of 30! I then just had 30 stitches on one needle, and the remaining 30 on another and continued like that. No idea if that was right but it seemed to work! I seem to have made some sort of mistake as on the purl side the rows kind of go a bit wonky. I tried to correct it a bit but it seems to look OK from the right side so decided to leave it. SOS!!! At the start of each row, you have to slip a stitch. I have worked patterns like that before and never know why. Does it serve a purpose? Aneeta's Answer: You will discover the reason for slipping the first stitch of each row of the heel flap when you are picking up stitches along the heel. You have to pick up stitches for half the number of rows you've worked and the slipped stitches at the start of each row are bigger and run over two rows so you can see exactly where you have to pick up the stitches for the foot. This will make persfect sense when you get to it...honest! Tomorrow I hope to get the shaping done! Getting exciting now, it is looking more like a sock! Doing the heel involved a bit of knitting and turning and purling and turning, decreasing stitches and also picking up a stitch on each row. Then we get even more exciting! I had no idea how the foot bit would work out, but you have to pick up stitches from the side of the flap, along the stitches left on the other needle from when we first started the flap, up the other side of the flap, and then a few more stitches to get to the start of the round. Now to shape the instep is to decrease 2 stitches on every other row. This was a bit confusing having to remember how many stitches I have done, and to be changing needles half way though counting. 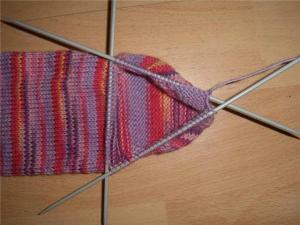 I am now working straight until the foot is the required measurement from the heel. I am about half way there just now. Might get the first sock finished tomorrow! Looky Looky!! 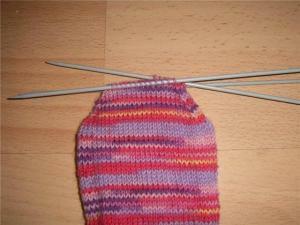 Now on the the second long straight bit, nearly finished and getting ready for the toe shaping! I have about 4cm more to go! I was hoping to finish the sock tonight, but I don't think I will now. Managed to get all the toe shaping done before I went to work. I was a bit worried about how long it would be before the toe shaping starts, but I compared it to a bought sock and it seems OK. So, tonight I get to finish the sock! The toe grafting was a bit hard to follow. Had to do a quick visit to my mum for a final bit of help! It makes a really good flat seam. 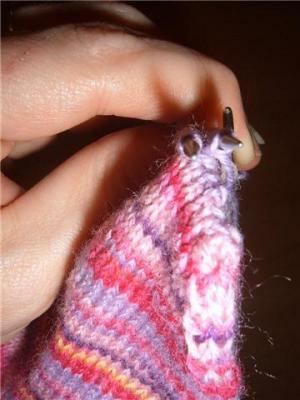 Instead of casting off, you use a tapestry needle and put it purlwise and knitwise through stitches in a certain order and slip them off the needle. Had to have no interuptions at all when I was doing this to make sure I did it right! One finished sock! Very pleased with it! It is a bit tight for me, especially when getting it on. It was suggested to me to cast on with a bigger size needle. I am a size 6 and did use the correct instructions. It fits my daughter better so I may let her have the pair, and do me a bigger size. I have ordered myself a book of sock patterns and can't wait to start some pretty designs!! Fancy writing the diary of your latest project? Drop me an email via the Contact page.